Google’s latest focus on mobile-friendly search should really come as no surprise, as every year people spend more and more time glued to their smartphones, tablets, and now their wearable devices. What’s more of a surprise, is that many businesses waited until now to begin optimizing their online practices, content, and websites for the mobile explosion. Perhaps some of the panic and frenzy around Google’s algorithm tweak, which some are claiming as “Mobilegeddon,” comes from a general misunderstanding as to how SEO works, particularly as it relates in a mobile environment. Search engine optimization is often one of those buzzwords that can sound overly complicated and includes complex theories filled with confusing technical jargon, but in reality, the rules can be quite simple. The goal of a search engine is to deliver results that are the most relevant and the best equipped to answer a user’s search query. The search algorithms or crawlers are designed to emulate how a human visitor would interact with your site and in many cases, optimizing the user’s experience of your mobile offerings can yield better search results. While there are certainly technical aspects and a plethora of design changes to consider when implementing a mobile search strategy, you should aim to take a logical step-by-step approach to help avoid becoming overwhelmed. To be better equipped to tackle your mobile SEO challenges, consider the following mobile elements and SEO resources to incorporate into your strategy. The following are mobile-friendly SEO best practices and considerations to keep in mind while optimizing your website and content for mobile. Take note that not all of these elements are correct for every business; you should focus on the tactics that best align with the current state of your mobile efforts. It’s important to consider that your mobile visitors are likely to be limited by their devices. Often, when searching on a mobile device, your visitors will have to work with slower computing power, a diminishing battery life, and a slower Internet connection. All of these factors may weigh in the back of the user’s mind and can increase their likelihood of being in a hurry. If your website takes too long to load or they cannot find the answers to their search queries quickly, they will likely leave your site for another. The key to designing your website for performance is minimizing the stress that your site places on the user’s mobile network while also improving the user’s chances of finding what they need quickly. By using smaller image sizes and lower-quality videos you can decrease the amount of data the user will need to load, which can better ensure that your site operates quickly. However, you want to be careful not to decrease the quality too much and create a worse experience for users with faster connections. Instead, incorporate mobile-friendly options for your content when possible. For example, if your website offers high-quality downloadable content that is packaged in a large file, give the user a variety of other file size options to choose from, such as a mid- or lower-quality option. This allows your audience to decide which content works best for their device’s limitations, and more importantly, helps you cater to users with both slower and faster mobile devices. User experience is not only important for the happiness of your visitors, but it can lead to improving your mobile SEO by increasing some of the technical factors that search engines look to understand if you’re offering an enjoyable experience to your visitors like a quick load time, easy to use navigation, proper redirects, clean URLs, and more. The idea is that a website that functions properly and provides value to your audience is more likely to rank higher in search. To improve the user experience of your mobile website, content, or other offerings, consider the typical paths that you’d like your visitors to complete on your site and perform an audit on how your current site operates. Document any content, pages, forms, navigation errors, or other elements that can cause confusion and revise these hang-ups. Content should be easily readable without the user needing to zoom. Users should be able to get the information they need quickly and in one place. Scrolling should be vertical and not horizontal. It’s difficult to fit all of your content into a small screen and scrolling is likely; however, horizontal scrolling is not a common behavior on mobile devices and should be eliminated. Navigation should be intuitive, buttons should be large enough to click with big fingers, missed clicks can be very frustrating on a mobile platform because the user will need to wait to load the wrong content and then backtrack to find what they really needed. Form submissions should be short and to the point, remember that users on a mobile device are often in a hurry, and generally won’t stick around long enough to submit large forms. Note that some elements are now considered outdated or cannot be properly optimized for mobile and you should consider removing them. Detailed list of common mobile UX woes and how to correct them. Straight from the Google Developers page, this is how Google defines what makes a good mobile site. Flash is becoming more and more outdated as we speak and still cannot be rendered on many mobile devices. Any elements that disregard the needs of your visitors or alienate a particular mobile device should be removed. These are generally designed for users on a computer and a majority of mobile devices do not support plug-ins. Plug-ins can cause hang-ups, device crashes, and security issues in mobile browsers. Pop-Ups and Interstitials: These can be a nightmare for a mobile user. Some pop-ups can be very difficult to close on a small screen which can cause frustration for the visitor, not to mention, slow them down when they are trying to find their answers. Proceed with caution when using these elements on mobile. Research shows that up to 56 percent of “on the go” or mobile searches have local intent. Essentially, when people are looking for a businesses or products, they are interested in results that are local to them. If your business has any local elements, it’s important to leverage these search habits and optimize your site accordingly. Mobile searchers are commonly looking for the exact location of a particular business, their hours of operation, and their price and availability of a product. Google’s algorithms have grown to understand the needs of mobile searchers and rewards sites that have the most current and relevant information optimized across devices. To optimize your mobile SEO for local search, you’ll need to understand the intent of your audience and what they are expecting to find when searching for your products or service offerings. This information can help you choose better keywords and include the correct information in your metadata and content. Start by including your company name, phone number, business hours, and full company address into your site’s metadata and within a contact page on your website using schema markup. Full address meaning city, state, country, and the zip codes that your business serves. This helps search engines better understand where you are located and can increase your chances of appearing in a local search. A starting point for learning local link building, local listings, and on-page optimization. Detailed article for local strategy and tactics. A fantastic checklist of to-dos when focused on local search. The top search results that Google provides all include information such as phone number, hours of operation, address, and reviews that could be relevant to the searcher. Since local intent makes up a majority of mobile searches, you should include as much of this relevant information as possible when optimizing for mobile SEO. To further your local efforts, join local community groups, pages, and even local chamber of commerce chapters. These organizations can not only help your brand become more credible within the communities where you operate, but can also provide link-building opportunities that can improve your local SEO. In addition, you can increase your SEO presence by submitting your information to the search engines themselves, as well as different citation and review sites such as, Google Listings, Yahoo Local, Bing Places, Yelp, Angie’s List, and other local citation sites. 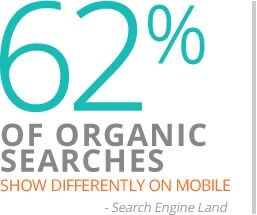 According to Search Engine Land, 62 percent of organic searches show different results on desktop and mobile devices. Because there can be such a large discrepancy in search results between platforms, you should understand and track your mobile keywords to make sure that your website is serving the correct audience. Track your mobile keywords by adjusting the search query settings in Google Webmaster Tools and documenting the keywords that are trending for your site. If it’s your first time using Webmaster Tools, note that it can take a few days to incorporate your website’s data and begin tracking your keywords. When Googlebot crawls your website, it looks for unique code snippets that identify whether or not your website is mobile friendly. It’s scanning to see if your mobile site uses a responsive, dynamic, or a separate URL for mobile users. Each requires different technical code for Google to properly index the site; neglecting this code could negatively affect your search rankings. When your site is using a responsive mobile design, Google can crawl your content without requiring you to create any additional code. Google is looking to see that your website is correctly setting the viewport for your visitors, which is typically included in the code when your site is using a responsive template or theme. Basically, the viewport is the code that tells a mobile device how to best display your web page or content based on the specifications of that particular device. For example, a properly set viewport will render your content correctly on Apple devices, Android devices, phablets, tablets, etc. Google recommends using responsive design. Sites that use dynamic designs render different content to desktop users than to mobile users. Google cannot immediately detect when a website is using dynamic content and you’ll need to “hint” to Google that you are still delivering a mobile-friendly experience. To accomplish this and optimize a dynamic design for mobile SEO, add the Vary HTTP code to your site’s header. This code signals to a user’s device that your content should be loaded according to their device’s specifications and can also help Google find your mobile optimized content faster. When a business uses different sites for desktop and mobile users, the coding for SEO can become much more complicated, which may be why this design format is falling out of favor. To identify a site that uses a separate mobile website, look at the site’s URL. A mobile-only site is generally indicated with an m.domain or mobile.domain URL (e.g, m.flickr.com, m.facebook.com, or mobile.twitter.com). Again, Google will not automatically detect that you have a mobile and desktop version of your site. To properly optimize this design for your mobile SEO, you’ll need to guide Google’s crawlers through your site by including code that connects your pages and content. Google recommends using annotations on your desktop webpages and canonical tags on your mobile pages to point its crawlers to the correct content. Mobile SEO: Responsive Design vs. Separate Mobile Site vs. Dynamic Serving — A handy guide that can help you determine which mobile design method is best for your business. A Cheat Sheet for Mobile Design — In-depth pros and cons when choosing between the three mobile design options. Multi-Device Layouts — There may be no better source than Google when designing your site for mobile SEO. These fundamentals not only explain the three design options in further detail, but guide you on how to implement each correctly for SEO. When determining which mobile SEO strategies will work best for your business, it is important to research a variety of sources and gather as much information as possible prior to creating any new initiatives. The following is a checklist of some top-notch resources to help you further dive into the mobile SEO strategies presented in this article. Google Mobile-Friendly Checker — This quick test allows you to gain insight into how Google views your mobile content and offers suggestions on how to improve any errors. FeedTheBot SEO Test — This comprehensive guide offers an in-depth tool to diagnosis any mobile-friendly issues that you may have and includes actionable how-to articles on correcting your mobile SEO issues. In addition, the site includes detailed analysis on a variety of mobile SEO functions. Google SEO Test — Google has compiled this guide to help you understand how to configure your site for multiple devices, inform the search engines of your mobile presence, and help you avoid some common mistakes while implementing. The Definitive Guide to Technical Mobile SEO — This article from Search Engine Land can help break down some of the more technical aspects of SEO. How to Rank in Mobile Search Following Google’s Update — UK marketing company WMG wrote this very detailed guide to help your site become more compliant with all of Google’s latest mobile SEO and usability requirements. Google’s 200 Ranking Factors — Brian Dean from Backlinko keeps an updated list on Google’s ranking factors and how important each element is when ranking your website. There is also a great checklist that you can download from this guide to help you avoid missing steps when prioritizing SEO. Google Keyword Planner — This tool can present the historical statistics and traffic forecasts for your keywords and is often the first tool an SEO specialist uses. Also, it’s a great resource when planning what content your audience is primarily interested in. The Definitive Guide to Keyword Research [e-book] — From long-tail keywords to competitive keyword analysis, this e-book has a great mix of detailed how-to and technical explanation with seven chapters of content. The KISSmetrics Guide to Keyword Research [3-Part Series] — When it comes to online marketing and SEO, the folks at KISSmetrics produce some of the most comprehensive analysis available. Although originally written in 2011, this guide can still be very beneficial for you keyword research. Google Design Fundamentals — Google wants to make it easy as possible for websites to comply with their new mobile-friendly search requirements and this guide offers detailed insight into: home page and site navigation, site search, commerce, conversion, and proper form entry practices. WordPress, ThemeForest, and Template Monster — These template resources can help alleviate the need for heavy coding when designing a mobile-friendly website. In addition, they offer a variety of responsive and dynamic templates for e-commerce websites, which can be more complicated to design. How to Create a Successful SEO Strategy — This guide discusses the key components of SEO: strategy, conversion, content, optimization, authority, and trust. 68 SEO Content Tools, Trends, and Tips for B2B and B2C Brands — The Content Marketing Institute often publishes great articles regarding SEO and this is one of the best resource guides available. The Advanced Guide to SEO — When it comes to SEO and content marketing, few writers are as established and knowledgeable as Neil Patel. This guide includes real-life examples, details screenshots, and nine comprehensive chapters to further advance your SEO knowledge. Not any one strategy or tactic is correct for every business and there is never a guarantee that Google or other search engines will rank your site higher, but by incorporating the techniques presented in this article, you can be better prepared to improve your SEO efforts. Search engines aren’t out to make your SEO work more complicated, they are simply trying to deliver the best possible experience for their users, something that should be a top priority for your business as well. By punishing a website or content that is not up to par on both desktop and mobile devices, search engines promote a competitive environment that drives many businesses to improve their online presence and user experience for their customers. Have you experienced a notable difference in your search ranking or keywords since Google changed its algorithm? What tactics are you implementing to increase your mobile SEO presence? What methods have you found to be the most effective at driving better SEO results? Share your answers and any feedback that you may have below.